MUMBAI: An audit by IIT-Bombay experts has found four road over bridges (ROBs) that criss over Central Railway tracks at Byculla, Chinchpokli, Currey Road and Ghatkopar unsafe and recommended several curbs. 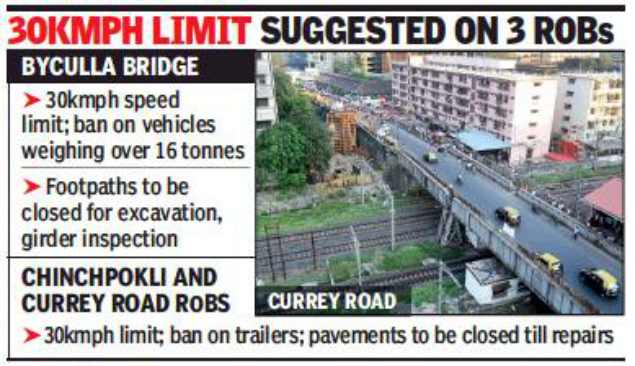 While the audit team wants a bar on trailer vehicles with over 16 ton weight from entering the four bridges, it has also recommended 30 kmph speed limit on Byculla, Chinchpokli and Currey Road ROBs. Besides, the Byculla ROB footpaths will be closed for excavation and girder inspection and the lanes adjoining the footpaths will be open for only light vehicles. On Arthur bridge (Chinchpokli) and Currey Road bridges, pavements will be closed till repairs are undertaken. Following inspections across Mumbai division following the crash of Himalaya foot overbridge at CSMT, the CR has asked Tata Power to remove the gantry that carries power cables above railway tracks at Chinchpokli. CR had even asked MSEB to take its cables below the tracks by micro-tunnelling system because the ones which pass above the tracks at 22 locations can fall on the OHE and hamper train operations. These are the first major recommendations for CR of the IIT team after it asked for demolition of Carnac bridge in south Mumbai and Patri Pul in Kalyan. The WR has also decided to raze the canteliver portion of Kalanagar ROB and carry out major repairs on Dharavi bridge. It has issued a notice asking relevant authorities to remove cables passing underneath these two structures within a week.